We have two town clocks in the village with bells that chime every half hour and then toll for the hour. In a rather endearing way, the clocks are five minutes different. But it doesn’t feel like they are competing for primacy, just that they are working in conjunction to make life simple. They seem to say – if you were late for anything important – “tranquillo, you have another five minutes if you use the other clock”. It is one of the standout first impressions of our new little village and has caused us to immediately fall in love with it. To give you a feel for our new home, you will have to forgive this first post being part reflections, part photoblog and part Clayton’s history lesson. 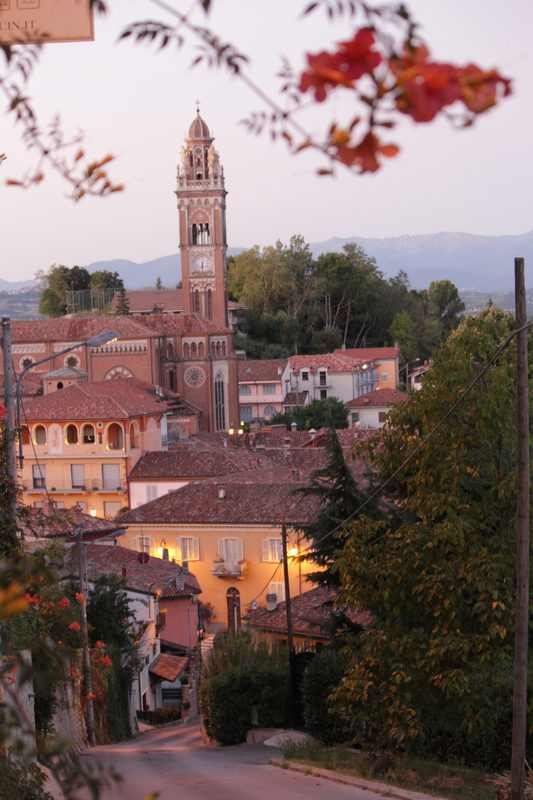 Monforte d’Alba is one of those postcard hilltop top villages in the Southern Langhe. The centro storico (the old town) is based around the original fortifications that were built during the Middle Ages and the walls (fortis) on top of the hill (mons) gave the town its name. 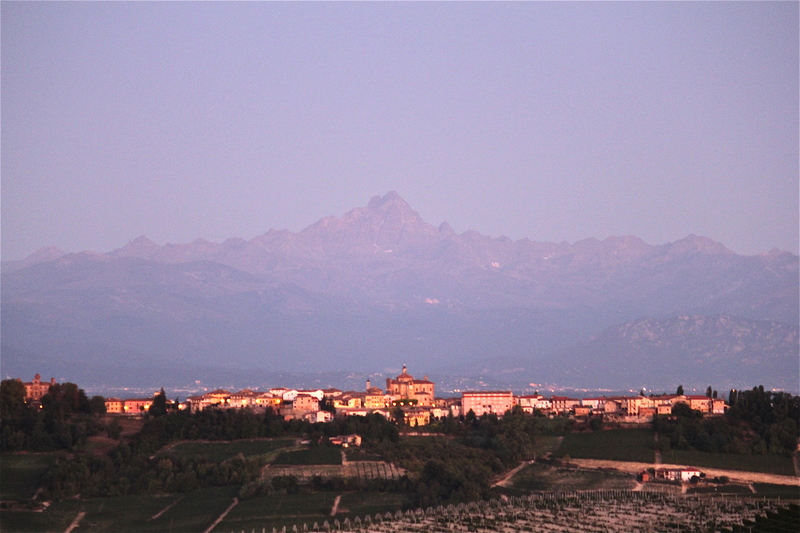 Monforte is beautifully located in the middle of the Barolo wine region. The commune now has some 2,000 residents officially spread over 25 square kilometres. It is a source of some amusement to try and decipher where the town starts and ends and if the commune is the town. The hilltop is now dominated by a Romantic belltower with the clock that chimes first. The tower is all that remains of a Medieval Church and stands in a quaint little piazza alongside two small but beautiful Baroque churches. The second clock chimes from the belltower of the Church of the Blessed Virgin “della Neve” (of the Snow). The church is located at the bottom of the centro storico alongside Monforte’s main Piazza. As should be the case in every good European village, its narrow cobbled streets have witnessed centuries of local feuding, siege and religious persecution. Notably, the original medieval castle was conquered and burned in the mid-11th Century when the Archbishop of Milan took exception to a local sect of Catharists. The Cathar residents of Mons Fortis were burned as heretics at the stake and tradition has it on a good night their souls can be heard wailing and moaning. If we decide to be brave, we may well investigate and report further but knowing my predlication for ghost stories, don’t hold out too much hope that the traditional story will be tested. Watching European towns and Cities wakeup and exploring them as they come alive is one my favourite things to do when we are travelling. As we try to adjust to the jet lag, S and I have been up and out walking the town from 5am over the past couple of mornings. As we have explored the town, walking around each corner reveals a different aspect of the countryside and as the sun comes up we discover more gems. I am sure the locals think we are mad but it gives the rest of the house a couple of extra hours of sleep. The days have been hot and clear so the Alpes-Maritimes to the south-west and the Haute Alpes to the north and west provide an amazing backdrop to the hillsides of vineyards and the fortified hillside towns. The locals are friendly but a little wary of the ‘stranieri’ and often finish our interaction (conversation would be stating it too highly) with “have a good vacation”. Their faces do light up though when the boys initiate some communication – T’s Australian accented “Bongiorno” works wonders and they just love S.
With the current state of my Italian, I am not attempting to correct the impression that we are just passing through. Having said that, each interaction has been very pleasant and my broken Italian is tolerated or gently corrected. Thus far it has been a great way to ease into a daunting language immersion.